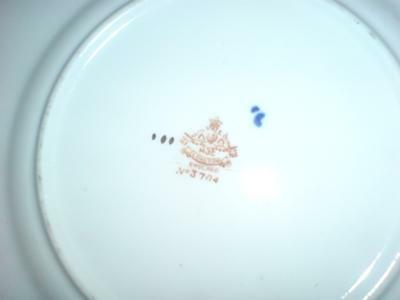 I have a 21 piece tea set, some pieces are marked royal vale china longton with the crest and some with what looks like HH and co, that I have found is actually NH and C with the man on the toilet. The pattern no is 3704. I have tried the replacement site , ebay google etc as suggested but I haven't been able to find mine , the closest I have found is pattern 3702 which is similar colouring, my set has golden butterflies and other differences. I would try your other method ,but I have not got a credit card to get it valued or examined online. 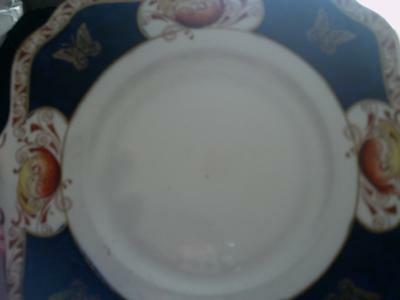 There is 1 saucer replaced (by previous owner) with a similar avoca piece , and I would like to correctly replace it. I am also thinking about selling it as is ,but as mentioned cannot really find very much about it online, and would like to know more to try and get some idea of a selling price. I include pics of the 2 different markings , and of a plate from the collection. Dear Sarah, The company that made your china is now owned by Royal Doulton Tableware LTD. Try going to their website http://www.royaldoulton.com/GB/Tableware and e-mailing them from the site. They do have a section for discontinued china. If they cannot help, then my best advice would be to start searching eBay for Royal Vale. EBay also has forum for certain items, China or Tableware, being one of them where you can post questions such as asking for the pattern name and I believe they have a Wanted section as well. Thanks a million Blake, I've emailed Royal Doulton, so hopefully they have some info , and I am going to try the ebay forums. Will let you know! Sarah, I was intrigued to read that you located some Royal Vale 3702. I know it wasn't what you were looking for but I am searching for it. ! I've had no luck so far on the internet. I would be so glad if you could you tell me where you found it. Recently some plates from my grandmother's vintage tea-service slid from the dresser where they were displayed and dislodged a sugar bowl, cream jug and some cups and saucers. Unfortunately they were badly broken. I long to replace them. Can you help ? Sorry I havent been online in a long time, I dont know if your still looking for some replaement pieces? What a nice surprise to hear from you - and yes I am still looking for some Royal Vale 3702 replacement pieces. I broke a tea plate, cream jug and sugar basin. However a cup and saucer would be very acceptable and would fill a nice hole in the display on my dresser left by the disappearnce of the sugar bowl and cream jug. I came across some Royal Vale plates recently at a little antiques sale in Ashton-on-the Water in Derbyshire. They were cobalt and bronze but had some green colour in them. Sadly no butterflies like the ones you are looking for. I understand you came across some 3702 during your own searches and wondered if you could point me in the right direction ? I'd be so grateful if you could.